IPitomy Virtual Fax makes faxing a breeze no matter where you are. Faxes can be received as email. For outbound fax send faxes right from your desktop or even your mobile phone. Of course IPitomy also has a device to connect your Fax machine if you prefer to continue to use that technology. FAX technology has changed over the last decade. Email and scanning has impacted the way most customers handle faxing. The use of SIP Trunking to reduce expenses is driving virtual FAX services as a way to reduce expenses and increase efficiency. You can keep your existing FAX Number. While some businesses still rely on FAX to conform to industry regulations such as HIPPA, it is no longer necessary to retain an expensive analog phone line to use FAX. With IPitomy FoIP (Fax over Internet Protocol), eliminate the cost of analog lines while improving quality. Choose a package that fits your company. Fax outbound from your browser, desktop, email or from a traditional fax machine. Receive your faxes via email or fax machine. Set up a group email to connect with multiple employees. IPitomy offers two fax options, one virtual, and one as a fax replacement over the Internet. Each virtual Premium account includes one fax number and one email account and unlimited inbound faxing to an email address as a .pdf attachment. Outbound faxes are sent through a convenient browser based web application or using desktop software. Faxing has never been easier. Just upload or attach your document, enter in your fax# and hit send! 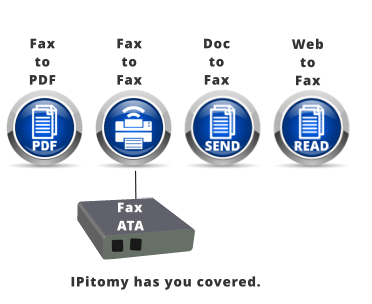 The IPitomy Virtual Fax with ATA uses the Internet to replace your traditional fax line. Your fax machine connects to an ATA device. It works just like your old fax line, but over the Internet! You continue to use your traditional FAX machine just like it is connected to a traditional phone line.